Click here to hear ELV speak a truncated version of these words on KNPR (this past Thursday) in the mellifluous tones for which he is known. And after half a dozen meals there in the past year, I couldn’t agree with him more. Many things have handicapped RC since it opened in March ’08 – not the least of which was the bottom dropping out of the economy almost immediately after it opened its doors. It also doesn’t help that the restaurant is practically hidden behind a double bank of escalators just off the casino floor at The Palazzo. But finding it isn’t exactly hard, and once you do, you will enter The World Of Charlie T. – handsomely represented by three distinct rooms. To your right is Bar Charlie – the domain of Hiroo Nagana – a Japanese chef of supreme confidence specializing in hand made, mostly raw seafood and vegetable delicacies served kaiseki-style as a succession of small plates. In appearance, Bar Charlie resembles a long, low, black lacquered, fourteen-seat sushi bar (displaying no fish however). Had it opened three years earlier, it might now be spoken of in the hushed tones reserved for Masa in New York or Urasawa in Los Angeles. 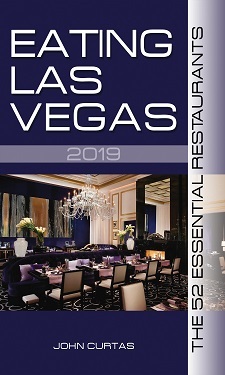 As luck would have it, this stylish, innovative concept (for Vegas anyway) of quality over quantity has had to struggle to gain acceptance with the Las Vegas convention crowds – and the American food writing press. Those who take the plunge are amply rewarded with artfully composed creations that change daily — like kampachi with pickled pork belly and kumquat, or Charlie’s take on egg drop soup (with lobster and sea urchin), or crispy abalone with fennel and saikyo miso – each a combination of Japanese refinement and American earthiness. Likewise, a dish of small, fried, five-spiced globe artichokes — dressed with thick streaks of honey, mint sauce, pine nuts and shiso leaves, or Tasmanian ocean trout — compacted into a perfect, one bite cylinder, draped with pickled fennel and salmon roe and garnished with a fresh-made barley “chip” – are tiny masterpieces of composition and explosive flavors. The quality of the seafood here will also take your breath away (thanks to Fed-Ex and UPS), and the complex recipes always highlight the main ingredients without overwhelming them. Those impeccable ocean ingredients, and the thought that goes into these arcane combinations, are what you’re paying for. (In a town of expensive restaurants, Bar Charlie is at or near the top.) But for those seeking the pristine and the inventive, in all things seafood, it is a must-stop on any gourmand’s journey. Both Trotter’s food and his attitude have softened over the past fifteen years, and his Las Vegas outpost can be enjoyed as a tasting extravaganza, or a cherry-picked a la carte experience. Either way, you will find plenty of awe-inspiring eats on the menu. Before the meal starts though, a cocktail at the eight-seat, L-shaped bar is practically mandatory. Because whether your libation tastes run from the vintage (a true Pimm’s Cup) to the modern (a Japanese Sunshine made with Dreamy Clouds Nigori sake, Okunomatsu soju, fresh grapefruit and orange juice and candied orange), there is a hand-made cocktail to suit your tastes – or the bartenders will gladly whip something up on the spot. They make all their garnishes, syrups and mixes in house, and change the sixteen-drink list seasonally, so pleasant surprises abound at the bar as much as they do on your plate. From whatever your aperitif, it’s a short stroll into the 80-seat dining room – highlighted (literally) by a Chef’s Table looking down on both the room and the kitchen. Start with either hot or cold apps and focus on such ingenuities as Dungeness crab salad with sake and rice milk (really a foam), or a terrine of Maine skate wing with celery root, pearl onions and seaweed. I’ve even found myself taken with his warm salad of heirloom beets and pickled egg – which is really saying something for someone who has advocated a “ban the beets” boycott in restaurants throughout the land. Equally compelling are warm items like a tart of lobster with Spanish chorizo and black trumpet mushrooms and caramelized onions – the flavor of each ingredient strongly in evidence – or a tempura-fried Icelandic langoustine with cockles, celery, atop a Yukon Gold potato base and sprinkled with just enough roasted shallot vinaigrette to make a difference. To say the cooking here is almost perfect is an under statement; to call it sublime is much closer to the mark. Almost nothing comes to your table looking like you think it should, that “flan” being a deconstructed one – with chunks of lobster sitting on a mille-feuille disk, surrounded by mushroom essence – both as sauce smudges and foam. Entrées disconcert as well, but in delicious ways. I expected fried sea bream with citrus, chile and cilantro to be garnished with same, instead all three had been whirled into a deep green, speckled emulsion of such intensity that it should supplant hollandaise or beurre blanc as every chef’s go to fish sauce. Hand harvested sea scallops are properly sweet and simply napped with a parsley emulsion, and the simple square of Casco Bay cod tastes like some guy in a Nantucket rain slicker just hauled it off his boat – yet another in a long list of sublime dishes to be experienced. I haven’t tried the dry-aged rib eye, lamb, or Japanese beef – each of unimpeachable provenance – but anyone who orders a steak in a restaurant that has fish swimming through its logo ought to have their head examined. As a finale, there are Vannessa Garcia’s desserts. Only twenty-six years old, and with only in-house restaurant training to guide her, this James Beard nominee is a savant with sweets. Her platings might give a classicist pause – so jumbled do they appear – but after a moments reflection you will appreciate the abstract impressions taking place before you. And like an impressionist, her riffs on a theme are rooted in a deep appreciation of classical forms. For example: her goji berry ice cream with quinoa, persimmons, spiced cranberry and orange sauce – where quinoa provides the bass notes for tart and sweet flavors to play off of. In another, Garcia’s semolina “pudding” – sort of a crumbling corn bread with a higher education – is garnished with infused blueberries surrounding a tarragon semifreddo and a lime-basil sorbet. In both cases, what appears decomposed is anything but, and like an abstract painting, a lot of thought and composition have gone into making it look so haphazard. Best of all, Garcia’s creations will knock you over with their intensity. A savant indeed. Both Bar Charlie and Restaurant Charlie are very expensive. Expect to pay at least $200/person at Bar Charlie. In the main restaurant, dishes can be ordered a la carte, and prices range from $20-$32 for appetizers, and $38-$75 for main courses, and no one frowns if someone at your table just wants a couple of small plates. It’s encouraging to hear that Restaurant Charlie should be around for a while. While it’s one of my favorites, the only time in four visits that I saw a crowd was at Bar Charlie during the Palazzo’s Date Night promotion; here’s hoping those folks spread the word! Restaurant Charlie is at least in the top 5 restaurants here in town. Thank you for giving it the treatment it deserves. I finally had the opportunity to dine at Restaurant Charlie three weeks ago. The full tasting menu was one of the best meals I have ever had in Las Vegas, right up there with Robuchon (the Mansion), Guy Savoy and Alex. John, have you tried Urasawa yet? If you haven’t, I invite you to do so. I wouldn’t mind hearing your comparison. John, isn’t Bar Charlie’s chef’s name Nagahara, not Nagana? I thought I got Hiroo to spell it for me when I visited, and the small number of Google hits seem to agree. this reads like an advertisemnet for the place!!!! but you do have somethings right, it is great food, the problem is the service, it is WAY too uptight for vegas. at no point during the experience do you feel welcome or invited, and the same applies when charlie himself is standing in the dining room. someone needs to dislodge the stick from his @ss and actually have him walk around the room and talk to his guest who are paying GOOD money for an experience instead of standing like a stiff in the room waiting for the laments to grovel at his feet.